During the second half of the fifteenth century Portuguese navigators began to explore the West African coast. They arrived in Benin between 1472 and 1486, finding a sophisticated society ruled by a monarch, who was probably Oba Ozolua or Oba Esigie. The Portuguese had hoped to convert the people of Benin to Christianity but discovered them to be more interested in trade. 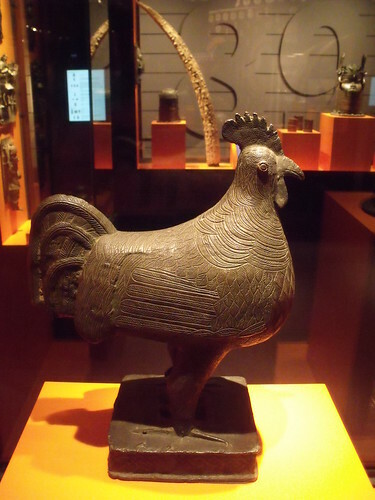 The arrival of the Portuguese coincided with great political and artistic developments under the guidance of the oba (king); from then on most of the Benin 'bronzes' were cast from European brass acquired through trade. Coral beads and large quantities of brass manillas, which were melted down by Benin smiths, were traded by the Portuguese for pepper, cloth and ivory, and for slaves. Figures of Europeans such as this Portuguese soldier were kept on royal altars or on the roof of the royal palace in Benin city. The Portuguese were represented in Benin art in various forms. Their arrival by sea and the bringing of luxury goods enabled the Portuguese travellers to be incorporated into Benin ideas associated with the god Olokun, ruler of the sea and provider of wealth. Legend has it that the Oba fought with Olokun on the beach, subdued him and stripped him of his wealth. The exhibition of European figures probably commemorated and celebrated this victory. horns and lanceolate ears, a row of bells pendant below; fine aged patina. height 8 1/2 in. Portuguese traders arrived on the west coast of Africa during the late fifteenth century in search of trade, treasure and political influence. By the sixteenth century the city of Benin in modern Nigeria was trading pepper, cloth, ivory and slaves with the Portuguese in exchange for luxury goods. The Portuguese also commissioned Sapi artists along the coast of western Africa in present-day Sierra Leone and Guinea Bissau, and Yoruba or Edo artists of Benin to produce decorative spoons, more elaborate salt cellars and hunting horns for sale to sailors. The ivory salt cellars combine images of status from two cultures: the Portuguese Christian religious imagery, coats of arms, and scenes of the nobility hunting; and Benin motifs of royalty and men of high rank with swords and elaborate costumes. The Virgin and Child surmount the lid of this salt cellar, symbolically triumphant over a series of snakes which embellish the lower part of the vessel. Frequently referred to as 'Afro-Portuguese ivories', these objects are now seen as perhaps the first examples of 'tourist art' from Africa. Through time Benin’s rulers have used the arts to interpret history in an effort to support their initiatives and define their images for posterity. In the 18th century, Oba Eresoyen purposefully associated his reign with that of Oba Esigie, the great 16th-century monarch. Both ruled during periods of relative peace and were important patrons of brass casting. This richly embellished stool is modeled on one that was sent to Esigie by the Portuguese. The stool’s complex iconography includes images of the cosmos, the forest, and terrifying supernatural forces. The tools and products of metal workers—including a hammer, knife, and anvil—represent human civilization. Boxes shaped like antelope heads are usually made of wood embellished with brass sheeting. This ivory example, inlaid with brass, is unique and undoubtedly belonged to the oba. Antelope-head boxes are used as containers for kola nuts, a symbol of peace, order, and civilization that is offered to welcome honored guests. The kola nuts are broken into segments and shared among the guests by rank followed by a prayer of blessing. The antelope is appreciated for its beauty and gentleness. The hands that grasp its horns symbolize the privilege taken by humans to sacrifice the animal in sacred rituals. Dimensions 7 3/4 x 4 1/4 x 2 1/2 in. The regal face of the leopard inspired this cast brass lid, an excellent instance of an early work from the Kingdom of Benin, combining a refined naturalism with an ornamental surface treatment. Tthe entire surface is covered with detailed designs consisting of concentric circles, interlocking teeth, and patterns within patterns. The status of the object is evident in both the prestigious metal of which it is made and the representation of the leopard, a powerful animal with royal associations. Functionally, this lid would have covered a container used to store small items, such as kola nuts, beads, or shells. Though the exact dates of Benin objects are unknown, two clues to the early production of this piece are the lid’s stylistic similarity to castings of full leopard bodies at this time and the thinness of the metal. Thinner casts indicate a paucity of copper, a component of brass, which was scarce before the Edo increased trade with the Portuguese. how come my video is not showing? I don't know. What is the link to your video? Just watching a BBC program on TV, called Bargain Hunt. They had a Benin sculpture on the program, and the expert said that every item of Benin Art is unique-some may resemble others, but there is no deliberate mass production. Decorative plaque for the palace of the oba, king of the Kingdom of Benin dating from 1550-1700. They usually showed scenes of rituals and life in the palace. After the Kingdom suffered an abrupt end in 1897, the arrival of this pieces in London attracted the attention in artistic circles.